Instant high gloss finish. Does not contain silicone. 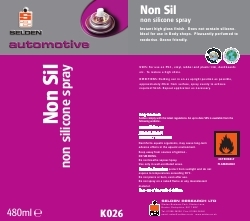 Ideal for use in Body shops. Pleasantly perfumed to reodorise. Ozone friendly. For use on P.V.C., vinyl, rubber and plastic trim, dashboards etc. To restore a high shine. Holding can in an as upright position as possible, approximately 20cm from surface, spray evenly to achieve required finish. Repeat application as necessary.